NEW YORK, July 18, 2017 /PRNewswire/ -- New York City-based luxury real estate marketplace Concierge Auctions is revealing its latest lineup of luxury properties, totalling 21 real estate offerings across 13 U.S. states and four territories/countries. The impressive property roster includes a 300-acre gentleman's ranch in Jackson Hole, Wyoming; a waterfront compound with a custom auto showroom in Washington state; a 1,580-acre collection of eight ranches in Big Sky, Montana, representing arguably the last large acreage of developable land in the Rocky Mountains; a 20± acre private island in picturesque Tahiti, French Polynesia; and a contemporary retreat with seamless indoor/outdoor living on California's Santa Catalina Island. Each property will sell in the coming weeks, most via Concierge Auctions' mobile bidding app, allowing prospective buyers to bid from any continent worldwide in real time. 17 of the 21 offerings will sell Without Reserve, to the highest bidders. "This summer, Concierge Auctions is spanning the globe with a robust pipeline of luxury properties," said Laura Brady, president and founder of Concierge Auctions. "From Connecticut to California to the blue lagoons of the South Pacific, each offering is impressive in its own right, carefully curated by our expert team. We encourage people to download our custom mobile app and place a winning bid or watch bidding live on auction day." A 300-acre gentleman's ranch, The Ranch is comprised of an impressive 6,000±square-foot main residence, a day lodge that can be converted to a guest home, and organic farming facilities. The main estate offers a great room boasting 16- to 20-foot ceilings, a master bedroom with a private porch, marble-clad bath, and waterfall shower head, and a Louis XIII French fireplace. The two-story lodge features a restaurant-grade commercial kitchen, great room and bar, main dining space that holds up to 60 people, and private meeting room. Outdoor amenities include an enclosed porch, courtyard, stone fireplace, and wood-fired pizza oven. The organic farming facilities also include a five-acre farm with a diverse array of produce and herbs, a two-acre plot of English lavender, and a small orchard of semi-dwarf apple, cherry, and plum trees. A temperature- and humidity-controlled greenhouse produces world-class tomatoes in the summer. 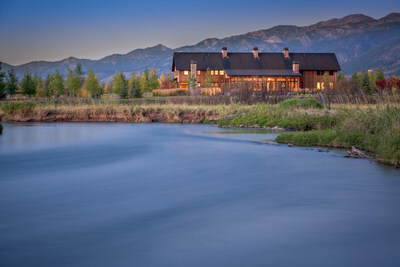 With four-and-a-half miles of Salt River frontage spanning both sides, residents and guests have easy access to world-class fly fishing — all just 45 miles south of Jackson Hole in Star Valley. Founded on the idea of mountain hospitality, this tranquil location is ideal for a personal escape, residential development, or even a corporate retreat. Previously listed for $40 million, The Ranch will sell At or Above $15 million in cooperation with Pamela Renner of Jackson Hole Sotheby's International Realty. A waterfront compound located on Gig Harbor's desired Wollochet Bay, this property is comprised of more than seven acres including 450 feet of waterfront with deep water moorage, a custom garage/showroom, a separate caretaker's property, and three helipads. The European-inspired carriage house features custom finishes, hardwood floors, beamed ceilings, Venetian plaster walls, and a cast stone gas fireplace. The large French doors of the impressive great room offer stunning views of Wollochet Bay and Mount Rainier. A car enthusiast's dream, the compound's auto showroom is complete with air compressors, wash bays, an RV garage, and maintenance equipment. Additional specialty rooms include a wine cellar, workshop, and staff quarters. Situated just one hour from Seattle upon a peninsula on the Puget Sound, Gig Harbor — previously named one of Smithsonian Magazine's "Top Five Small Towns" — is home to championship canoe and kayak racing teams, local breweries, dining, shopping, and parks. Previously listed for $10.5 million, Wollochet Bay Compound will sell Without Reserve in cooperation with Randi and Joseph Brazen of Brazen Sotheby's International Realty. The last large acreage of developable land in the Rocky Mountains, Yellowstone Preserve is an immense, 1,580-acre property comprised of eight mountain ranches and infrastructure for eight home sites plus a caretaker site. In total, the property offers more than two-and-a-half square miles of mountain views, forest, and wildlife; more than one mile of Gallatin River frontage; nearly two acres of Gallatin National Forest border; and more than two miles of adjacent border with the famed Yellowstone Club. All eight ranches offer unique amenities including panoramic mountain views, abundant wildlife, private trails, and more. The Dunraven Ranch — arguably the best of the collection — boasts unmatched mountain views in every direction, 309 acres of forest, meadows and talus gardens, and access to the Gallatin National Forest. Conveniently located just minutes from Big Sky Town Center, Big Sky Ski Resort, Moonlight Basin, Spanish Peaks Mountain Club, and the Yellowstone Club, the property offers easy access to modern conveniences as well as a variety of outdoor activities including rafting, horseback riding, wildlife watching, and golfing. "A collection of nine home sites, Yellowstone Preserve is impressive acreage bordering Yellowstone Club, National Forest, and the Gallatin River," stated Exclusive Listing Broker Martha Johnson of The Big Sky Real Estate Co., who has repeatedly partnered with Concierge Auctions in the past. "It's arguably one of the last intact large acreage holdings in the Rocky Mountains in the heart of everything wonderful about Big Sky. Boasting easy access to skiing, hunting, fishing, hiking, mountain biking, four-wheeling, and snowmobiling, this property is the perfect opportunity to build an executive retreat or family compound. As Yellowstone Preserve is not being offered publicly, this auction is truly a once-in-a-lifetime opportunity." Previously listed for $39.9 million, the property will sell in cooperation with Johnson. Motu Tiano — an approximately 20-acre private island along the turquoise waters of the South Pacific — consists of a Polynesian-style home with all of the furnishings, security, and modern amenities needed to live a life of tranquility, including a spacious living and dining area and fully-equipped kitchen and bathroom. The home accommodates up to 15 people. With premier surfing, sailing and diving, the property's lush tropical gardens include palm trees and allow for views across the lagoon to the mountains beyond. Outdoor amenities include an outdoor deck, private wharf, covered dining area, large dock, boat house, and deep water access to launch and moor yachts. Just a short boat trip from Raiatea, the second largest of the Society Islands, Motu Tiano offers convenient connections to dining, shopping, and other nearby islands. "My wife and I have traveled widely but nowhere else in the world offers the natural beauty and tranquility of Motu Tiano," stated Jim Simpson, seller of the property. "The local people are so welcoming and helpful, and the French Polynesian culture still includes a number of ancient traditions, which have been passed down from generation to generation. Life on Motu Tiano is peaceful and relaxing, and we will very much miss our home here, but as we approach retirement, we have decided it is time to pass on this beautiful home to another owner." Currently listed for $11.88 million, the island will sell At or Above $6 million in cooperation with Maima Sylvain of Agence Jeanine Sylvain. With panoramic views of Avalon Bay and the Pacific Ocean, gated 223 Beacon Street boasts more than 6,800 square feet of privacy and seamless indoor/outdoor living. The contemporary home is comprised of a fully-equipped fitness room; two guest suites with full bathrooms; a gourmet kitchen; master suite with a hideaway television, oversized bath area, and walk-in glass shower; an open entertainment and media room including a state-of-the-art sound system, custom pool table, and see-through fireplace; and an impressive wine and tasting cellar room. Floor-to-ceiling glass walls are offered throughout, in addition to contemporary glass elevator, dumbwaiter service, and custom built-in cabinets. The property also comes with ample outdoor amenities including a custom wood-fired pizza oven, bocce ball, horseshoe pit, wooden gazebo, infinity pool, and 2,000-square-foot entertaining space. Located just 22 miles southwest of Los Angeles, Catalina Island is known for its diverse flora and fauna, prime diving and snorkeling waters, and its highest peak, Mount Orizaba. Currently listed at $7.88 million, the property will sell Without Reserve in cooperation with Kelly Nelson Brown of Kelly Nelson Brown Real Estate. In cooperation with Martha Johnson of The Big Sky Real Estate Co. Previously Listed at $7.5 million. Selling Without Reserve. In cooperation with Linda Behr and Josh Behr of LIV Sotheby's International Realty. Previously Listed for $7.9 million. Selling Without Reserve. In cooperation with Billy Long and Matt Johnston of Ranch Marketing Associates. Previously Listed for $17.5 million. Selling Without Reserve. In cooperation with Monica Monson of Russ Lyon Sotheby's International Realty. Previously Listed for $2.495 million. Selling Bidder's Choice between Chateau 16 | The ROBERT, 2009 N 1st Avenue; Chateau 17 | The CHARLES, 2013 N 1st Avenue; and Chateau 18 | The BETH, 2017 N 1st Avenue. Selling Without Reserve. In cooperation with Bill Thompson of Abaco Real Estate Agency. Previously Listed at $2.499 million. Selling Without Reserve. In cooperation with Sally Field of Sally Field Real Estate. Currently Listed for $2.345 million. Selling Without Reserve. In cooperation with Sherri Milkie of William Raveis Real Estate. Previously Listed for $2.5 million. Selling Without Reserve. In cooperation with Rita Feeney of F.O. Bailey Real Estate. Previously Listed at $2.8 million. Selling Without Reserve. In cooperation with Lisa Yakulis of Kurfiss Sotheby's International Realty. Previously Listed for $2.15 million. Selling Without Reserve. In cooperation with Joshua Gold and Roy Barbu of Boca Dreams Realty. Estate: Previously Listed for $3.599 million. Lot: Previously Listed for $799,000. Selling Without Reserve, Separately or Collectively. In cooperation with Warren Backer of Engel & Völkers New Orleans. Previously Listed at $3.4 million. Selling Without Reserve. In cooperation with Cliff Meredith of Meredith Fine Properties. Previously Listed for $7.7 million. Selling Without Reserve. In cooperation with John Redd of SkiHome Realty. Previously Listed at $2.9 million. Selling Without Reserve. In cooperation with Liane Read of Sea to Sky Premier Properties. Previously Listed for $5.885 million. Selling Without Reserve. In cooperation with Chester Rendell of New Zealand Sotheby's International Realty. Previously Listed for $18.995 million. Selling At or Above $4 million. As part of Concierge Auction's Key for Key™ giving program in partnership with Giveback Homes, each of these sales will result in a new home built for a family in need. The firm's initial commitment will equate to over 100 homes through the balance of this year. Concierge Auctions offers a commission to the buyers' representing real estate agents. See Auction Terms and Conditions for full details. For more information on any of these auctions, or if you have a remarkable property to submit for consideration to the Concierge Auctions platform, call 212.202.2940. Concierge Auctions is the largest luxury real estate marketplace in the world. Powered by state-of-the-art technology, the company has generated over $1 billion in sales and is active in 37 US states/territories and 15 countries. Concierge curates the best properties globally, matches them with qualified buyers, and facilitates transparent, market-driven transactions in an expedited timeframe. The firm owns what is arguably the most valuable, ultra-high-net-worth client list in real estate and has been named one of America's fastest-growing companies by Inc. Magazine for the past three years.